According to press reports, the First Baptist Church of Decatur, Georgia is set to consider Julie Pennington-Russell as its next pastor. The historic Georgia congregation would be the largest church associated with the Southern Baptist Convention or the Cooperative Baptist Fellowship to call a woman as senior minister. Without doubt, this is a major development. The church Pennington-Russell leads at present, Calvary Baptist Church in Waco, Texas, is probably even now the largest church with historic connections to the SBC or the CBF to call a woman as pastor. That claim will not hold up. The church points to the proposed pastor’s qualifications and gifts, but if the church’s pastor search committee had chosen a man as their proposed candidate, the development would not have received nationwide news coverage. The church is making a statement. While records on Baptist women in ministry are hard to track, experts in the field said May 29 that the Decatur congregation would likely be by far the largest church of Southern Baptist heritage ever led by a woman. “I can’t think of any other church that would have been bigger,” said Pam Durso, a Baptist historian who serves as an officer with Baptist Women in Ministry. Her group is finishing work on a new study that, its leaders say, will be the most comprehensive survey of the extent of women’s ordination in modern-day Baptist life in the South. Durso said the study has identified female senior pastors in 117 congregations that either are affiliated with the SBC or trace their roots to the denomination. She said the study has documented 1,825 women who have been ordained as ministers in such congregations. The vast majority of those churches are affiliated with moderate splinter groups — such as the Cooperative Baptist Fellowship and Alliance of Baptists — that grew out of the conflict in the SBC. However, while such groups are officially supportive of women in ministry, few large moderate churches have called women as senior pastors. A 2006 report from Durso’s group said only 5.5 percent of churches that are affiliated with CBF had female pastors. The distance between “official support” and churches actually calling women as pastors has been considerable, as the research clearly indicates. Advocates for women pastors have pressed their case that the absence of women from moderate and liberal churches indicates a failure of nerve and a compromise of conviction. The issue of conviction is central to understanding this issue. A look at Julie Pennington-Russell’s education, experience, and related qualifications would appear to qualify her for a major pulpit . . . except for the fact that she is a woman. On that point both sides in the controversy over women in ministry should agree. Those opposed to the service of women in the pastorate are not arguing that women are less articulate, less bright, less winsome, less caring, or less educated. Gender is the issue. For those who support and celebrate women as pastors, this singular concern is irrational. For those who believe that the Bible is clear that only men should be pastors, this singular concern is non-negotiable. The Southern Baptist Convention has made its convictions on the issue clear. The adoption of the revised edition of The Baptist Faith & Message in 2000 elevates the issue to confessional status. This is a natural consequence of the denomination’s commitment to biblical inerrancy. The Bible clearly calls for male leadership in the church — and particularly in the pulpit. Southern Baptists have chosen to affirm a complementarian understanding of gender roles and leadership, seeing these principles as clearly set forth in the Bible. The culture is on the side of those who support women pastors. We live in an egalitarian age. At the same time, that support seems to be more about talk than action. Until this development in Decatur, no historic moderate church affiliated with the SBC had called a woman as pastor. Moderate and liberal Baptists are not alone in this respect. A “glass ceiling” exists even in explicitly liberal Protestant denominations. Christianity Today recently reported that a group of churches affiliated with the Presbyterian Church USA [PCUSA], fed up with the liberalism in that denomination, were looking for a new denominational home. The group, known as the New Wineskins Association of Churches, is now moving toward affiliation with the Evangelical Presbyterian Church [EPC]. According to the magazine, the group chose the EPC over the Presbyterian Church in America [PCA] because of the fact that the EPC allows for women to serve as pastor and the PCA does not. Yet, it turns out that only two congregations in the EPC have women as pastors, and one is set to retire soon. Yet, lest we become too judgmental of our brothers and sister in the EPC and those who would join them, we must take a moment of honest self-reflection in our PCUSA fellowship. Ordained women, especially those called to the ministry of Word and Sacrament, know full inclusion in the ministry life of the PCUSA in name only. After 50 years, women still face the “glass ceiling” across the theological spectrum of the church. “Our church is not quite ready for a woman pastor…” “Perhaps as an associate, but as the senior pastor…?” “If the senior pastor is a woman, how will our men relate…?”… And so it goes… One glance at the larger pulpits of our denomination proves the point. The First Baptist Church of Decatur sits in a prominent location in that venerable city, now part of the Atlanta metroplex. The church has a history reaching back to the Civil War and was associated with the Southern Baptist Convention from its inception. Even now, the church allows its members to designate support for SBC causes. The church’s Web site indicates that 80 percent of its members designate support for the Cooperative Baptist Fellowship, and 20 percent choose to support the SBC. Many similar churches have made an absolute break with the SBC. Recent pastors of the church included Dr. Peter Rhea Jones, who left the faculty of The Southern Baptist Theological Seminary to become pastor of the congregation in 1979. Jones, a well-known New Testament scholar and moderate leader, retired in 2000 and now teaches at Mercer University‘s McAfee School of Theology. 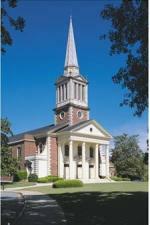 The church is well-known throughout the region and is well established among moderate Baptists in the South. At the same time, the church is not the “megachurch” described in some press reports. In 2006 the church reported a weekly average Sunday School attendance of 451. A source at the church reported average weekly worship attendance of just over 500. [The figure for Calvary Baptist in Waco is 340.] In comparison with the average congregation in the United States, First Baptist Church, Decatur is a large church. But it is certainly not a megachurch. Would the election of Julie Pennington-Russell as pastor of this church make history? Of course it will. This development would set a precedent that, until now, has eluded those pressing for women in major pulpits. First Baptist Church, Decatur, is in the heart of the South, has a proud place in the history of the Southern Baptist Convention, and can claim a legacy of prominent pastors. For a church of this stature to call a woman as senior minister is undeniably historic. What does this mean? Only time will tell. Advocates for women as pastors will hope to see this precedent followed in other historic moderate pulpits. Any number of factors may play into this equation, including a generational shift and a relatively small number of male seminary graduates from moderate schools headed for the pastorate. One prediction is an almost certain — Julie Pennington-Russell will quickly become one of the most prominent leaders among moderate and liberal Baptists. One additional development is just as certain. This move increases the visible distance between the Southern Baptist Convention and the constellation of moderate Baptist organizations disaffected from the denomination. The distance is theological, cultural, ideological — and growing. The Decatur church is set to vote on Pennington-Russell as Senior Minister on June 17. By all accounts, the church is indeed set to make a statement — and to make history. The distance between those who hold to different positions on the question of women in the pulpit is most evident in the fact that while some will see this move as a triumph, others will see it as tragedy. R. Albert Mohler, Jr., “Do SBC Moderates Really Believe Women Should Serve as Pastors? An Important Research Project,” August 21, 2006. R. Albert Mohler, Jr., “Biblical Pattern of Male Leadership Limits Pastorate to Men,” June 3, 2000. R. Albert Mohler, Jr., “A Call for Courage on Biblical Manhood and Womanhood,” December 16, 2003.